Sasayama castle was built in the early Edo Period, and Tamba Sasayama, where they originally prospered as a castle town, still offers many historical and traditional sceneries. will give you a great experience and joy. You will love the place even more than ever. We offer a variety of Rental Options and a complete set of KIMONO wears consisting of OBI(Belt), ZORI(Sandals), HAORI(Short Coat), and etc. Let’s take a memorable photo with KIMONO! 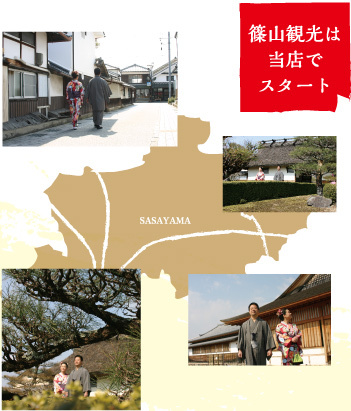 In addition to the Sasayama Castle ruins, we would like to introduce many sightseeing spots and points of interest such as: BUKEYASHIKIGUN(Samurai Residences), the TAISHO ROMAN Museum which was built in the 12th year of the Taisho era, and KAWARAMACHI TSUMAIRI SHOKA GUN(Traditional Merchant Houses). Let’s take photos with KIMONO at the places where you feel the nostalgia of old Japanese Tradition.